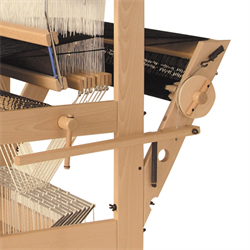 The Delta is a modern parallel counter marche loom based on the Hollandia (which it replaces) and the very successful Spring. The Delta is easily recognizable as the head of the Louet line of floor looms. 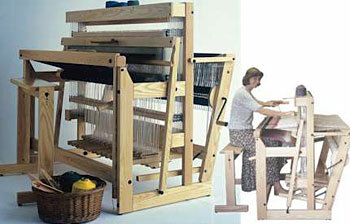 It is comfortable, robust and technologically advanced, but above all a weaver's loom. Warp tension can be adjusted by fine increments to insure the tension is just the way you want it. The floating breast beam insures tension is returned to exactly the same tension as you had before you advanced the cloth. Tie ups are easy. Every treadle is tied to every harness which means you only have to depress one treadle at a time. All treadles work the same way across the full width of the loom because of the parallel system. The Delta's treadles are hinged from the back allowing for a very light weight treadling action. Also, all lams are horizontal which makes changing tie-ups quick and easy. For individual comfort, blocks are available to adjust treadle height. The brake on the Delta is a friction brake system on the warp beam, which is sturdy and easy to operate. A convenient advancing system is provided on the cloth beam. The Delta is made of plantation grown ash and is finished with a double coat of clear semi-gloss lacquer. The Delta 110 has a weaving width of 110cm (43 3/8”) and comes equipped with a built-in raddle and shelf, stainless steel reed 40-10 (metric), 1200 (Delta 110) or 1400 (Delta 130) Texsolv heddles (330mm), tie-up and lease sticks and 16 warp sticks. The Delta 130 is the same design as the Delta 110 except for its larger weaving width of 130cm (51 ¼”). Weight: Delta 110: 88 kg (194 lb), Delta 130: 93 kg (205 lb), add 8 kg (17 lb) for an extension. We have found that most customers find the castle section of Louet looms difficult to assemble correctly. That is why the Delta is delivered partially pre-assembled. The difficult castle section is one unit with the remaining warp beams, treadles, cloth guard, cloth beam, etc. coming in several separate boxes. Assembly of these pieces is required. The Delta is made of plantation grown ash and is finished with a double coat of clear semi-gloss lacquer. The Delta 110 has a weaving width of 110 cm (43 3/8”) and comes equipped with a built-in raddle and shelf, stainless steel reed 40-10 (metric), 1200 (Delta 110) or 1400 (Delta 130) Texsolv heddles (330 mm), tie-up and lease sticks and 16 warp sticks. The Delta 130 is the same design as the Delta 110 except for its larger weaving width of 130 cm (51 ¼”). add 8 kg (17 lb) for an extension. Download the Spring instructions for assembly manual. Extra weights for the beater of my Delta loom? Are reeds interchangeable on the Louet Delta? Is the Louet Delta the right loom for you? The Delta loom has a folding backbeam, so it takes up less space when not in use, and it can fit through most doors. Jane demonstrates!